If your shop is anything like mine, you’ve got a large selection of colorful cans claiming to contain the best and absolutely only lubricant you’ll ever need. I’ve been sucked in by the marketing more times than I care to admit, hoping that the next product will really set itself apart from the others and magically unstick all the stuck stuff in my mechanical life. It never happens, though, and in the end I generally find myself reaching for the familiar blue and yellow can of WD-40 for just about every job. But that’s the easy way out, and it’s not always – or often – the best choice. With that in mind, I wanted to explore what exactly lubricants are and how they work, to enable more informed decisions on which lube to choose. So why do we even need lubricants in the first place? Why can’t two pieces of metal ground and polished to a mirror finish just be rubbed over each other? In a word: asperities. 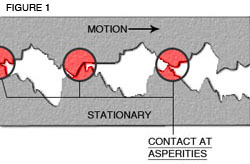 Asperities are the microscopic peaks and troughs that cover even the most finely finished surfaces, and when they drag over each other, they snag and catch. The force needed to overcome the friction this creates can break off the tiny peaks, resulting in both wear of the metal surfaces and heat as the kinetic energy is transformed into thermal energy. Lubricants are just substances that keep surfaces separated. In the case of our finely polished metals, a lubricant may be a fluid that fills the voids between the asperities, reducing snagging. Friction is reduced, the heat that’s created is conducted away from the surfaces, and any asperities that do touch and break off are flushed away by the lubricant. Of course not every lubricant is a fluid, and not every fluid lubricant is a liquid. Dry lubricants abound, including graphite, Teflon, graphene, and molybdenum disulfide. For the home shop, though, liquid and semi-liquid lubricants are probably the most convenient, so we’ll concentrate on them. Most – but not all – lubricants common in the home shop are based on some form of mineral oil, which is just a highly refined petroleum distillate. Various substances, including viscosity modifiers, detergents, and corrosion inhibitors are added to the base oil to give the resulting lubricant different properties. One way to classify liquid lubricants and select the right one for the job at hand is to look at viscosity. The thinner the lubricant, the easier it can flow and wick between surfaces, while thicker lubes can typically stand up to higher pressures and temperatures. On the thin end of the viscosity spectrum we find the penetrating oils. Usually the first product we reach for when a rusty bolt resists our attempts with a wrench, penetrating oils are just low-viscosity oils that can seep into the threads and lubricate the surfaces. Common brands include Liquid Wrench, PB Blaster, Kroil, and the ubiquitous WD-40. Each product claims to have just the right mixture of secret ingredients needed to dissolve rust and release that frozen bolt with minimal effort. All of these products work to some degree, but do they justify their expense? Maybe not. In 2012, a group of engineering students from Drexel University studied alternatives to commercial penetrating oils, which are often expensive or hard to come by in developing countries. In a controlled series of experiments, they determined that a simple mixture of vegetable oil and acetone was far superior to WD-40 in reducing the breakout torque of nuts rusted onto bolts. Similar comparisons show that a 50-50 mix of automatic transmission fluid (ATF) and acetone beats the commercial penetrating oils at a fraction of the cost. I must admit that I’ve always been disappointed at the performance of commercial penetrating oils when it comes to rusty fasteners, so I’m keen to try out an oil can filled with the ATF-acetone mix. But I doubt I’ll be giving up on WD-40 altogether – after all, it makes a dandy adhesive remover, and I’ve never found anything better at getting tree sap off my hands and tools after a day on the woodlot. Moving way up the viscosity scale, we find the greases. Greases are semi-solid mixtures of a base oil and some kind of thickener, usually a soap. Greases exhibit a characteristic property called shear thinning – when shear forces are placed on them, their viscosity decreases. That makes it sticky and thick enough to let you pick up a small nut with a dab of grease on a fingertip, but stepping on a drop of the same grease would make you slip. The soap used to thicken the grease determines some of the lubricant’s properties. One of the most common greases is lithium grease, formed by thickening a base oil with the soap lithium stearate. Lithium soap adds thermal stability and high load handling properties to grease, as well as bonding well to the metal. Lots of additives make it into modern greases, such as anti-oxidants, corrosion inhibitors, or even solid lubricants like molybdenum disulfide or Teflon. Unlike penetrating oil, a DIY alternative to commercially prepared grease is probably more trouble than it’s worth – but that doesn’t keep people from trying. Since grease selection is highly dependent on the application, what you should stock is based on what you do. A shop that does a lot of auto work will need tubes of molybdenum grease and a grease gun; shops that specialize in electronics might need a tube of heat sink compound, which is a high-temperature silicone grease with zinc oxide added in. Silicones are interesting compounds. While the base oils in most greases are based on the hydrocarbon polymers in petroleum, silicones are polymers with a backbone of silicon and oxygen. The polymerization reaction and the selection of monomers can be tweaked to produce silicone oil or various kinds of silicone resins with properties similar to rubber or plastic. Silicone oils, most notably polydimethylsiloxane (PDMS) can be mixed with a thickener like vaporized quartz sand or Teflon to make silicone grease. Silicone grease tends to be rather expensive and so its use is limited to places where a little dab’ll do you, like lubricating O-rings or preventing laboratory glassware fittings from seizing up. Silicone grease is often used in automotive brakes, too, due to its ability to resist heat breakdown. Most lubricants needed in the home shop are based on mineral oils. But long before they become fossil fuels, living things often find a way to provide useful lubricants. Sheep’s wool is the source of one of the most useful natural lubricants, called woolwax or lanolin. Sheep secrete the waxy substance from their skin to keep their fleece from becoming like a sponge in a rainstorm. It’s washed from fleeces with hot water and detergents in a centrifugal extractor and purified into a solid waxy substance with a melting point near body temperature. That makes lanolin an important component in cosmetics and in medical products, but that doesn’t mean it can’t be used in the shop. One extremely useful and somewhat underrated lubricant is a product called Fluid Film. 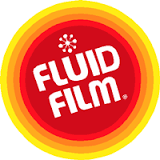 Very big in agriculture and the marine trades, Fluid Film is basically liquified lanolin. When it’s sprayed or brushed onto metal, the lanolin penetrates and leaves a waxy film that makes the metal as waterproof as a sheep. It’s especially important in lubricating cutter bars in combines and harvesters, where hydrocarbon-based lubricants can cause burning when crops are cut. I use Fluid Film everywhere, especially on tools that will be exposed to the elements. It does have a distinctive aroma that might not make it welcome in an enclosed space, so check it out before spritzing on that squeaky hinge on the front door. No one lubricant product does it all, but if I had a “desert island” pick, it’d be Fluid Film for sure. WD40 – worst jack-of-all-trades product ever. The lasting gumminess and dust/dirt attracting counteracts any lubricant properties it may ever have had. For a commercial penetrating oil, try something like PlusGas, and don’t forget that time is your friend – leave things to soak as long as possible. Having said that, prevention is better than the cure, so use a protective coat of grease to start with when possible. Agreed. WD-40 has almost no legitimate uses. It’s certainly not a lubricant. Also, seriously, don’t wipe it all over your hands as a “soap” either. Wear gloves at the very least. I mean WD40 isn’t even a jack of all trades product, it’s just been marketed that way so long that people think it is. It’s literally a water dis-placer. Trying to use it as a lubricant is just a bad idea as it’s going to dry out quickly and is a solvent for most other common lubricants, leaving the what you’re trying to lubricate worse off than if you just hadn’t messed with it. I use it largely for the “solvent for most other common lubricants” property. It’s great for hosing off old grease and oil sludge, the pressurized spray action helps. It’s basically Stoddard solvent (dry cleaning fluid, white mineral spirit, et c.) with a little light oil added. I’ve got a big can of straight Stoddard solvent for things like soaking cone bearings, but I think all of the vehicles and toolboxes have a can of WD-40. As mentioned, it’s also great at actually doing the job on the label and displacing water. Spray down a rain-soaked trailer harness connector, pack it full of dielectric grease (silicone grease with no metals, really), and good to go. Also don’t use this as a rust inhibitor, it may displace water, but it is really actually hygroscopic and will attract moisture to whatever you’ve sprayed to “protect” and it will quickly rust. WD-40s actual purpose was a corrosion inhibitor and water displacer for the Atlas ICBM, which used a paper think balloon tank to maintain rigidity of the rocket’s structure and was made from stainless steel. This. The name says it all…. Water Displacement formula #40. (the other 39 didn’t make the grade) That people found other uses for it meant a bigger market for the manufacturer. I usually use it more as a protectant cote on my garden tools than a penetrating lubricant. This. Why would he use WD40 as a lube? On fishing lures as an attractant, yes. But a lube? And there are better displaces and corrosion inhibitors now for electrical connectors. WD-40 PROMOTES rust, it does not prevent rust. Exactly. WD-40 is not a lubricant. HaD writers should know this. Yep, it’s mostly stoddard solvent. Works great for as a cutting fluid for cutting aluminum. Vaporized ethanol. Sound flammable. I’ll try it. Fire extinguisher is always nearby. Been using denatured ethanol or isopronanol for ages in copious amounts when working with aluminium. At first i was a bit afraid that the sparks from the motor of my mill could let it catch fire. Is it flamable so you have to be a bit cautious, at least on my bench, i never had a fire. WD is just as if not more flammable than ethanol. Ethanol is also significantly more flammable and evaporates too fast. I love the smell of WD-40. WD-40 => Water Displacer #40. It’s meant to be a preservative, not a lubricant. No idea where people got the idea to use it as a penetrating oil or lubricant of any kind. In the clock repair industry it is known as the clock-shop-job maker as people hose down a clock they like, then it stops, and they take it to the clock shop for repair, which means cleaning the WD-40 off and replacing, where required, with actual clock oil. It also worked great to wring more printing out of cloth dot matrix and daisy wheel printer ribbons. When they were really out of ink, I’d open up the housing, dribble some stamp pad ink over the wadded up ribbon then spritz with WD40. Then I’d spin the knob round and round until the ribbon running in the open was evenly black. Time consuming but cheaper than new ribbons and a lot cheaper than a re-inker with a motor to run the ribbon around. I don’t know how many times I’ve done that myself, but I’ll tell you what: I don’t miss THAT part of the good ol’ days at ALL. I like the silicone greases and oil trademarked Super Lube (Grainger, MSC and Amazon carry it) as well as ZEP 45 Penetrating Lubricant with TFE. Regular white lithium grease, available at your local auto parts place, comes in handy for screw threads exposed to weather, gears, and such. Super Lube grease is great for 3D printer mechanicals. It’s safe on printed plastic pieces as well as the plastic bearing retainers on the cheapo linear bearings many of them use. No mention of the fluorinated oils? The polymer chain is completely saturated and contains only the elements carbon, oxygen, and fluorine; hydrogen is not present. On a weight basis, typical fluorinated oil contains 21.6% carbon, 9.4% oxygen, and 69.0% fluorine. Fluorinated oils? No chance, we must protect our precious bodily fluids. Mix any drink you want. I’ll pure grain alcohol and rain water. While I sip, what happens with these oils when they are physically cut like petroleum oils with their decreasing viscosity as they cut cut up into smaller more volatile chunks. Is there extra fluoride around to “heal” the ends? WD-40 works well for what it’s designed to be…a light solvent which leaves a waxy film. It loosens and protects electrical connectors exposed to weather (like on your car) — try it on one of those rubber covered connectors — they pop right apart, and it also works great on the rubber grommets that the pins on your muffler go into. No matter how frozen they are from sand, dirt and salt, a good shot of WD-40 and they slide right out. Wasn’t WD-40 made with experimentation / iteration? That’s what I have read, but what product isn’t the result of experimentation/iteration? WD-40 is kerosene (check the MSDS), It may be bad for rubber, but most “rubbers” on a car seem to be safe for kerosene. Shudder… I’d get mixing boards in for repair that smelled like WD-40. It meant we were going to be replacing all the slider pots especially, but often the rotary potentiometers, too. WD-40 is terrible for electrical/electronic contacts. Most of it evaporates and it leaves a hard film. But first, it washes all the lubricant out that was protecting the contacts from corrosion. I have heard Marvel Mystery Oil recommended. Any experience? I use MMO frequently in my cars and tools. MMO bottled to be ‘used as a fuel and oil additive’ seems to work great, but I have no scientific data to back that up, other than when combined with Mobil1 oil in an engine, the internals on all my engines have remained healthy and un-gummed. I also use it in fuel without incident, but again I can’t really give an answer as to how effective it is, aside from not having any issues or stuttering due to fuel. I also use MMO air tool oil in my air tools and it works great for keeping the rust and dirt away. I really like NeoLube for dusty environments. It is ultra fine graphite in colloid suspension with isopropyl alcohol.. Paint it on, allow the alcohol to dry and you have a graphite film lubrication on your surface. It is also good for reversing rusty surfaces. Just apply a film and wait a week or two, the rust goes away, replaced with carbon. Stuff isn’t cheap, but it should be possible to make using a ball mill. I see no one mentioning Triflow in the comments, so I had to chime in. It works well in situations where you need lubrication, but dust and dirt are a major problem. Tri Glide – great for bikes, electric fan bearings, actuator cables etc. ad infinitum, but not a heavy lube. Mouse Milk (yes, that’s a thing) – a witch’s brew of limonene and ethyl lactate. Used in aviation and costs like it but will absolutely unstick nearly anything that’s old/grimy/corroded. Also, Fluid Film is not durable (hey, it’s sheep oil…what do you expect?) – it has to reapplied every year. I’ve been tempted to try to use Bag Balm (which was issued as low-temp rifle grease in WWII) but I’m too cheap. Tri-Flow brand even has a grease version and can come in a non-aerosolized lil’ bottle. Wasn’t Bag Balm designed for use on cow udders? That’s what it says (or something like that) on the cans of it that we have. Also, it works wonders on dry hands. Sources: I live on a dairy farm. depends on the hardware that needs lube. PB blaster I’ve had the best luck with. I’m in love with the Motorex 2000 Grease. I buy it in the 850gram containers for use on my mountain bikes (and all my friends), but I also use it everywhere else. I find it to be really good at sticking on something forever, and keeping dirt out (it will however trap lots of it in the outer layer if exposed directly, like on the underside of a rear derailler). You can literally wash it, and it will stay on. If you apply it in small amounts inside the bearings on the bike, and pack the seals with a fair amount, it will keep everything out, even when riding through heavy mud up to the bearings themselves (it does happen to me, yes I ride my bikes pretty rough). It does slow you down a little, compared to the “faster” greases available, but for mountainbike use where you mostly descend freely on large downhills, or climb at 10 km/h uphill, it’s more than fine, as you get that “perfect” rust inhibition and near impenetrable dirt protection. If you are to believe the marketing hype, it was developed for and is still being used in alpine skilifts. I like it. I can’t remember the names, but every mini tube of bike lube I’ve tried has worked excellently for low heat applications. Great on dirty hinges. And how do your friends feel about you using it on them? The shop I am in uses a Kimball Midwest product called `Torq-CB penetrating oil. WOW. Does what PB never dreamed. The test here is the small nuts that retain the fan on the top of the outside unit on home AC. Often the guys have to pull that fan, and the studs break often, if not always. WD and PB were both used, and they did sometimes help. :( Torq-CB, wait 10 min, and off it comes. We also have golf course mowers that use screws to hold on the bed knives. On the bottom of the reels, exposed to dirt, fertilizer, water, etc. Normally quite the task to replace the screws. Now just spray with Torq-CB, wait for 10 min, then tap with a small chisel. Off they come with a screwdriver. With PB often they were a chip and drill procedure. :( They are installed with anti seize, but even that wasnt enough to make them easy to remove after service. ** and so I go read the MSDS before posting and find- “Not acutely toxic. Aspiration into the lungs during swallowing may cause serious lung damage which may be fatal.” So do be careful. Stuff smells like candy. I am NOT a rep/shill/salesman for KM. Just work at a place that uses KM as a supplier. I would love to find the stuff in the ‘generic’/ manufacturers packaging but I have never seen/smelled similar. ONLY seen it as a KM product. I’m a huge believer in PB Blaster. It’s my go-to for rusty hardware. A must for the torch and quench method. Works well on taps and drill bits too if I don’t have any tap magic or 3in1 nearby. It makes that wonderful pungent stink when it burns. I’ll have to seek out Torq-CB. Haha. Please don’t taste the lubes/oils. Unless you’re into that. I can’t stand the smell of WD-40. And I think we’ve all accidentally tasted it at some point. That lovely smell is trichloromethane. Yep. Chloroform. Don’t breathe too much of it. MSDS says “Dichloromethane”. Which is similar. An interesting type of grease I rarely see mentioned is damping grease. It actually slows things down. I’ve seen it used in camera lens helicals (mostly for manual focus lenses) but any time you need a knob to move smoothly and controllably or something like that it is worth a look. I wish it was more available (and cheaper). You can get “something” from China, of course, but I’d much prefer a Germany Switzerland or US source. I have some old cameras/optics whose original damping grease had congealed. I’d love to replace it with a modern version. Apparently, it comes either in 55 gal tubs or milliliters (at $$$/ml) and nothing in between. It also comes in multiple damping grades, from “turns easy” to “get out the vise grips” and everything in between. The dielectric grease is pretty close, I’ve never tried it on expensive equipment before though. Heh. We’re moving at work. The ME’s just threw out a Nye Damping Grease Lubricant Kit. I kid you not! There is some exotic flavors of this unobtanium for the broadcast industry. I need less than an ounce for the ball socket of an old Harris or Gray tone arm and less than two ounces, probably, for an old Australian-made camera tripod that is leaking at the seals. An inquiry into what the viscous grease is/is called in the latter always results in a friendly offer to ship the tripod back to the factory for a speedy rebuild ;-). I’d sure like to know what to call this stuff and where to get it at less-than-platinum per ounce prices. Spen dy rebuild, Mr. Eternal autocorrect–spen dy. Nothing speedy about their offer except the initial EFT. Quite a few turntables use it to slow the tonearm from just falling onto the record. It always annoyed me how expensive that grease was, but it took hardly any to do the job. On silicones, they should never be used on metal/metal interfaces, they have almost no lubricative properties in that situation. Silicones should be used for anything organic, plastics, rubbers, biological, etc. You can use silicones between organics and like or organics and inorganics like metal, glass, etc. So, use it to lube the o-ring on your flashlight but not the threads, use it to lube a squeaky shock absorber joint, use it to lube a plastic lead screw nut, etc. Remember with greases: use the same type that’s already there, or completely wash out *all* of the old grease. Incompatible chemistries can have interesting results, a lot of times the oil will come out of suspension and run out, leaving only the soap/binder behind — on some old greases this binder was clay, so not great for bearings! Personally I use Lucas Red ‘n Tacky on everything. It’s cheap, it’s very sticky, fairly high temperature, and I don’t have to worry about grease compatibility. You can get it in both small and large grease gun tubes, or tubs. Most automotive stores sell it. Too many people use WD-40 in places it doesn’t belong. Worse. It evaporates and leaves an anti-lubricating wax/lacquer behind. So this. Most lock makers now recommend their personal brand of dry lube which is just graphite and dry moly in some sort of evaporative carrier sometimes with a little Teflon mixed in. Grease usually isn’t a good idea because it tends to hold onto the dirt and bakes into a solid in the sun, just my 2¢. how else is he supposed to replace the motor as needed? Bad enough having them stash nuts in the air intake. I had a friend who owned a ford of a vintage when the spring that keep the brake caliper from rattling was a fail often part. Sunday afternoon in a small town where the auto parts stores where close to get the proper repair part. Not much of a mechanic but always willing to try. when he discovered what was causing the noise he used what he had on hand to fix it. He filled the gap with RTV gasket maker. When he had the car at a shop having a full brake job done he waited around until it was done. He said he kept quite when the mechanics discovered his fix and had a good laugh over it. No so crazy. I’ve used olive oil on kitchen door hinges before now. Not crazy at all! As I understand things, peanut butter was specifically invented for use as grease. The fact that it makes a tasty bread topping and sandwich filling was just a happy accident. kroil hands down beats everything even the 50/50 home made mix atf/acetone. Once you use that stuff you will never look at other penetrating oils the same way again. This. Can’t say enough good about Kroil. Lasts forever, does exactly what it’s supposed to do, works where any of the other competitor products just can’t get the job done. I swear by the stuff. +1 for Kroil. Better than PB Blaster and Liquid Wrench for me, and I’ve used it quite a bit on rusty suspension parts, stuff where you can’t even see the threads anymore. It’s not an immediate miracle fastener remover though; I give it some time to work, like an hour or overnight if I think it’s going to be a bad one. LW pretty much just makes a mess for me, I’ve never noticed any benefit. PB Blaster was marginally better. +2 on Kroil. There is always some in my garage for ornery nuts that don’t cooperate. I give it one minute, if it doesn’t come off, get the torch. Rarely has it failed me, outside of mechanical damage, but no lubricant can fix that. Oh, the pyretherin (SP I’m sure), in it also doubles as a damn good, but expensive, wasp spray. So if you’re working on something outdoors, and you find extra inhabitants where you don’t expect them, Kroil will take them out quickly. I use acetone + atf for penetrating oil out of habit mostly because I always have both in the shop knocking about and I can mix a batch up and put it in a pump up sprayer (they have short lifespans though, i think the acetone eats the pump seals over a few months timescale) , but wurth make a aerosol that has a penetrating oil component but also freezes the fastener with the spray so the oil works into the thread because of differing expansion rates and I’ve laid out for it for some really stubborn critical threads I knew would be seized bad, no hard numbers but it seemed to work well. I use wd40 to displace moisture too. I have a whole shelf dedicated to different types of grease and sprays. I use way oil on my lathe, iso46 hydraulic oil in my hydraulic machines, bar chain oil in the chainsaw bar lube tank etc. In short, I just use what the manufacturers spent thousands developing the perfect composition of lubricant for. The designers knew what they were doing and almost everything calls out a grade of oil or grease. Even if you make something from spares, the datasheets for the bearings or linear slides etc will have a lubrication spec to save reinventing the wheel badly unless you absolutely do know better than the specialist lubrication designer that called out the requirement, why not tap into that free expertise already invested? Cutting I use soluble oil mixed up in the right quantities, or paraffin for aluminium, and wd40 will do in a pinch if I run out. One last mention, anything tapping related gets a moly disulphide based grease to lubricate the job. All of this is in machinery’s handbook, people have been following the same logic for generations and that vast body of engineering knowledge is right there in book form for people to tap into to save reinventing the wheel and instead getting on with inventing something new not thought of already yet. Acetone + ATF … the fabled “Eel Snot” of Australian mechanics. Allegedly the best version has a little gear oil in it but I’ve never used it that way. I use HBN (Hexagonal Boron Nitride), sometimes called white graphite, for sliding on rods and things like that. Very slick and takes a lot of heat and abuse. It has been taking over from moly coating for bullets in precision shooting. You can also shot peen it to softer metals in a tumbler with some BB’s. Another amazing product is called Corrosion-X. Great to use as a lubricant, corrosion cleaner/resistant and for waterproofing electronics, etc. Yes, that stuff works really well. And has quite the smell, too. We use it on the few non-stainless-steel items in our cheese plant, to remove and prevent rust. I’ve been amazed at how well it works to clean rust off a pipe. sewing machine oil. for bearing it is desirable to have no solid additives at all. Yes! Do NOT use 3 in 1 oil in sewing machines! It’ll gum up. Decades ago I bought several vials of Typewriter Oil at a auto parts store that was closing. I think I still have one vial left, a light lubricant for little exposed mechanisms. Then there is Hammond oil to do about 300 or so fine bearings in the venerable Hammond tone generator. Once a year. Many fora full of info, but it comes down to no additive or remaining sulfur compounds. for and presto-just like new. now add some oil. Yes I’ve freed up a rusted pliers under water (hot water, though, not cold) after nothing else seemed to work. You guys have been posting some very interesting and useful articles of late. One thing I have noticed about vegetable oils is that there is an inverse relationship between their viscosity and their vulnerability to oxidation and polymerisation. For example walnut oil has a low viscosity but it is a “drying” oil and will turn into a varnish like coating over time. Coconut oil is very different, solid on a cool day but in it’s pure form far less likely to “go off” due to oxygen or exposure or heat. However at higher temperatures coconut oil’s viscosity drops below the other vegetable oils. So some more experiments in this area would be very interesting. Fat dictators need a lot of lube. Harbor Freight compressor in the back corner. I find it amazing that he is not holding something cylindrical in one of his hands… (often a pair of binoculars) probably something more “personal” when the camera isn’t around. What no KY or Astroglide? Coconut oil is far superior but will destroy latex quickly. Do you have any idea how hard it is to research an article on lubricants? I ended up down some dark, dark rabbit holes. We all have places where the sun don’t shine. Astroglide, hands down. So to speak. Since no one else mentioned it yet, Gibbs is a great multipurpose fluid, way better than WD-40. Also, add a lighter and you have instant flame thrower, seriously this stuff is highly flammable and shoots out a long stream. Gibbs is what WD40’s marketing team dreams it should be. It’s magic as a preservative and rust remover/preventative. innox is great, i use it everywhere and they have a food safe version! Does anyone know what kind of grease and fluid lubricant are used in professional/broadcast video tape recorders? Sony recommends (and sells) “SGL-601” grease and “Super Hyrando 68” fluid lubricant, but there are not cheap nor easy to buy. Try a bike-store lube. Small tube, precision dispensing. They have many different types. I worked on consumer VCRs for a very long time. If it rotates, dripless oil. If it slides, white lube is lithium grease, black lube is molybdenum grease. Rather than buy it at super inflated prices from TV repair supply stores, I would buy sewing machine oil from sewing supply stores, and automotive stores sell large containers of white lithium grease (also in tubes) and large containers of black molybdenum grease as brake lube. Rather than buy the expensive rubber rejuvenator to clean brand new belts and rubber rollers, I use transmission fluid. Put a little on a rag, use it to clean the surface of the belt or rubber roller/tire. Don’t use rubber rejuvenator on idler rollers that touch the tape, though. For that, alcohol can clean them. I used to resurface idler rollers on high speed tape duplicators with a chunk of black rubber. I’d rub it against the idler roller as it rotated. Takes the hard thin layer off of the idler without damaging the softer rubber underneath. People just don’t get it. WD-40 is NO lubricant. It is a creeping oil. WD-40 is meant to solve rust. It is meant to make things moving, but not to keep them moving. This is a simple misunderstanding about WD-40 which seems to never die. The best use for WD 40 is to spray a hornet nest with .It is cheap and kills the bastards better than any insecticides,plus with the straw it can just spray where you aim from far away.Everyone else thinks it,s some kind of lube but it evaporates away.Oh it’s good on snow blowers and shovels so wet snow don,t stick. Still a bit messy, a squirt bottle of pure ethanol kept in the freezer is the fastest killer of any insect that I know, and it leaves no mess. What’s the reason to cool it? It will not freeze in a domestic freezer but it will get so cold that it can freeze any living thing it hits, this gives it a faster knockdown then if that does not kill the insect outright the denaturing effects of the ethanol will. i.e. Liquid ice! You squirt a solid jet, not a wide spray. W/out fire.Thelittle bast***s don,t move after being wd40td.It does’ leave a mess either.W/a straw you can hit them in mid air and they go down! Nobody mentioned Vaseline? Excellent lubricant for all kinds of plastics. Found in household stores. When it comes to avoiding/reversing oxidisation of electrical contacts: battery pole grease FTW. On older cars I put some of it into every connector I can find and all these tiny electrical problems slowly fade away over the following weeks. Dielectric grease has saved me many times. Lawnmower won’t start? Probably cracked insulation or crack in spark plug (if you didn’t flood the carb.) Slather that thing with d-grease until you replace the item. They used to build barges in downtown Nashville. It was an event when periodically they (Nashville Bridge Company) would slide a new one down the ways into the Cumberland River, just upriver from where the Titan’s Stadium now stands. The lubricant? Rotten bananas; cheap, readily available and environmentally benign…at least compared to petroleum-based lubes. The smell must have been terrible! But kudos for not dumping more crap into our waterways! That is good thinking in my book. WD-40 is a water displacer. It evaporates and leaves a film that is NOT a lubricant. My father helpfully “oiled” my car door hinges without my knowledge when I was visiting on holidays. All I knew was that my hinges started squeaking really badly, and so I kept trying to get lubricants into the hinges. After two years of this, I finally noticed him spraying WD-40 right through the hinges, and asked how long he’d been doing that. The driver’s side door was now so worn that I had to lift it to close it. I hate WD-40. My father loves it and uses it on everything. I loathe getting in audio mixers for repair that stink of WD-40. Usually it was some bandmember or a helpful roadie that sprayed it into noisy pots. It meant replacing slider pots, and most likely replacing rotary pots. Use the lube/cleaner meant for potentiometers, it contains an oil that stays behind after the cleaners evaporate. That protects and lubricates the sliding contacts. Slider pots are a bit more complicated, as the brass to carbon requires pot lube/cleaner, but something like a lithium grease between the plastic top and metal. I’ve used spray olive oil as a cutting oil when drilling. Works a treat. I found out by accident that olive oil works great to prevent rust on carbon steel. I was at a weekend SCA event, back when we used regular Olympic fencing foils, epees, and sabers. I forgot my foil and epee out on a picnic table overnight. I’d tried many different kinds of oils to prevent rust, but that morning the blades were covered in a fine layer of rust. As an emergency measure, I soaked some olive oil into a rag and rubbed hard to remove some of the rust and coat the metal. I intended as soon as we got home to take some steel wool to them, clean, and recoat with some other oil. It was a year later that I suddenly remembered that I’d forgotten all about this. And that they still had the original coat of olive oil, and no rust in spite of being stored in a fencing gear back with a sweaty fencing jacket. There are also a host of other products by WD40. Why not just use that. It also works as a cutting lubricant. What can I use around the home that has No petroleum distilates for use on and around rubbers and plastics? Of course price is a factor and of course I live in a small town so not much availability. Not too many box stores around.